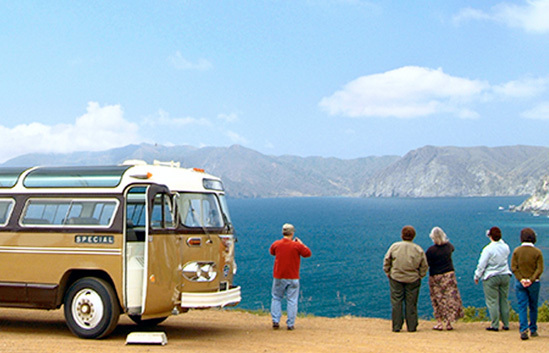 This exciting, narrated journey along the scenic “Skyline Drive” takes you ten miles into Santa Catalina Island’s protected wilderness area. Along the trip you’ll see spectacular vistas, deep canyons, quiet coves and an endless blue ocean. Keep your eyes open for the island’s largest inhabitant, buffalo, before you visit the Catalina Nature Center at the Airport in the Sky. The airport’s DC-3 Grill offers a quick bite and famous “killer cookies.” Bring your camera because picture-perfect scenes fill the entire tour. Advance reservations are recommended. *Roads are windy, dusty and rugged. Prices are subject to change without notice. Prices do not include Avalon City Admissions Tax or Harbor Use Fees. Tours and times subject to change. 2 Hours & 15 Min.